There are many kinds of holidays one can enjoy around the world. From an adventurous safari in the wilds of Kenya to a slow cruise ship journey north on the Pacific Ocean, watching the glaciers melt off the Alaskan coast. Some prefer roughing it and some prefer posh comforts. Some intend on going far from home; others relish the idea of having all the comforts of home wherever they go. These latter are the kind of affluent and intelligent travelers, with a taste for luxury, who enjoy our Exclusive VIE Shuttle Van service. At VIE Hotel Bangkok, MGallery by Sofitel, we can certainly point the way to a more outdoorsy, and humid, experience if that is what you like. It is easily found in the vast Bangkok metropolis. 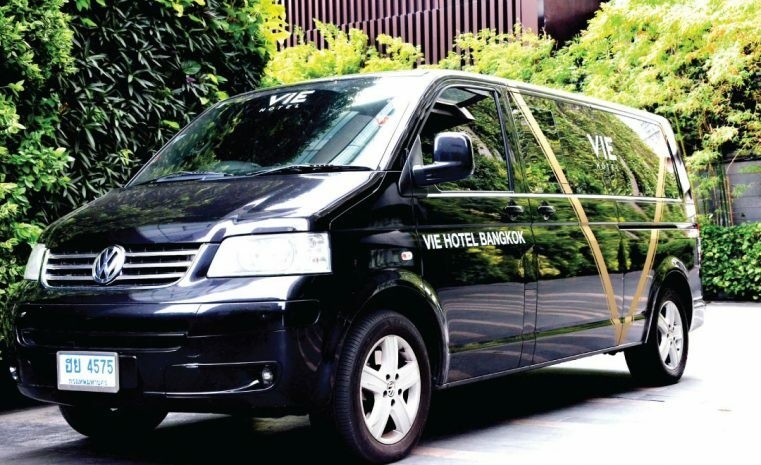 However, what is much rarer is what we offer exclusively to the guests of VIE Hotel Bangkok: a ride in absolute comfort precisely to the destination you enjoy most, the most renowned shopping malls Thailand’s. Our private luxury van is the answer to your dreams. There is no more sumptuous mode of transportation in Bangkok than the Exclusive VIE Shuttle Van, and we feel that our guests deserve nothing less than the very best. You may be wondering where exactly the Exclusive VIE Shuttle Van may take you. Never fear, its destination is exactly the place you have in mind in order to get the most out of Bangkok’s famous shopping, without already feel exhausted once you arrive there! The Exclusive VIE Shuttle Van service for our hotel guests only begins at noon every day, departing from the hotel and taking guests directly to the luxurious Harrods Tea Room, a prime location which offers easy access to the beautiful and exciting Siam Paragon, Siam Center and Siam Discover shopping centers. In 15 minutes, the private van returns to VIE Hotel Bangkok. The Exclusive VIE Shuttle Van makes this trip every hour of every Wednesday to Sunday , from noon until 5:00 pm. This is how we take care of our guests, by making sure they can get the very most out of the destinations they visit in Bangkok, and even enjoy the trip there, ensconced in the luxury of our special service, which is always exclusively for them.